Karastan rug cleaning is important to maintain the beauty and longevity of your Karastan rugs. First, though, let’s go over a little bit of Karastan rug history. In the 1920’s The Marshall Field Company modified an Axeminster weaving loom to create the world’s first machine-made rug. In 1928 Karastan Rugs was born, initially to skeptics who wondered how this “Mystery Rug” made by a machine would hold up to wear compared to that of traditional hand-knotted rugs. To prove that Karastan rugs would indeed hold up to its hand-knotted counterparts, Karastan made a large version of their still-popular Kerman design machine-made wool rug for the 1933-1934 World’s Fair held in Chicago. 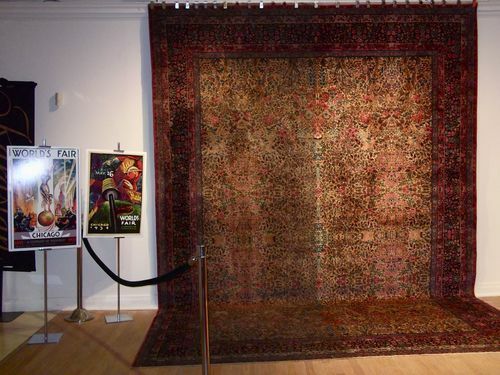 Instead of having it hanging vertically on display, Karastan placed the rug on the ground and invited the fair-goers to walk on it. 5 million people walked across that rug during the fair, subsequently spilling food and drinks across it. That’s a LOT of traffic! After the fair half of the rug was cleaned and the other half left soiled by the 5 million fair-goers. Here is a picture of that rug that’s still on display today. 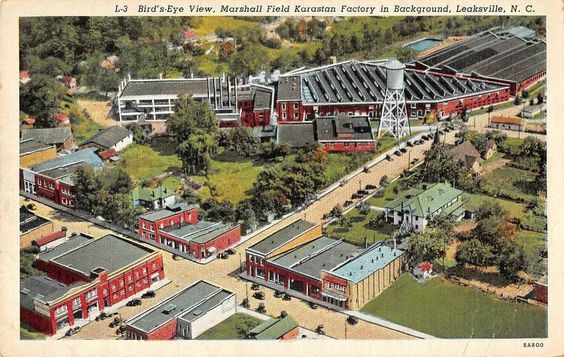 In 1993 Karastan was purchased by the carpet manufacturing giant Mohawk Industries and continues production in its Eden, NC mill. Our president, Scott Rendall, was lucky enough to take a tour of the Karastan rug mill in the early 2000’s, and it was very impressive to see. It’s no secret that we at Rendall’s Certified Cleaning Services absolutely love Karastan rugs, not only for their beauty, durability, and longevity, but also because they’re made in the USA. They are often heavy, especially during the cleaning process, but that’s just an indication of their craftsmanship and durability. Woven – these resemble woven Oriental rugs with the yarn pattern appearing both on the front and the back of the rug. Tufted – tufted rugs have a sheet glued over the back of the rug – therefore the pattern of the rug is only visible from the top. Woven Karastan rugs are made on an automated mechanical loom. Tufted Karastan rugs are made by first transferring the rug pattern on a foundation. The foundation resembles a large paint-by-numbers sheet with individual yarn colors and placement integrated within the printed pattern. Next, the patterned foundation is hung on large poles. Workers then punch dyed yarns, corresponding to the pattern, in to the foundation, spread latex on the backing, and then glue on a “scrim” (secondary backing) when the pattern is filled in. Lastly, the top yarns are sheared to the desired height and pattern. Karastan makes both wool area rugs and broadloom carpet goods. When having your Karastan area rugs cleaned it’s important to have the entire rug cleaned including the face fibers, foundation, selvage, and fringe, and not just the top-side. Due to gravity and weight of various soil like sand, grit, dust, soot, spills, pesticides, fertilizer, and other tracked-in or atmospheric soiling, the dirt finds its way down to the foundation of the rug where, if not removed, it can cause permanent damage from fiber abrasion, etching, scratching, and staining. 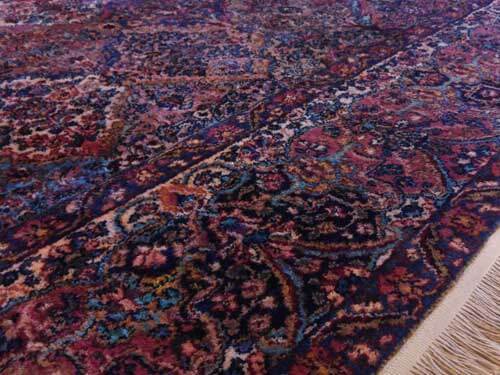 Karastan area rugs should be professionally cleaned at least every 12 to 18 months. Karastan also makes installed broadloom carpeting which should be professionally cleaned periodically – about once every 12 months on average, and more often in rooms with high traffic, use, and/or spills. Installed Karastan carpeting is cleaned on-location. Surface cleaning methods are not something we recommend on Karastan rugs because those methods cannot remove the soil buried deep within the foundation. The only times we may consider using low moisture surface cleaning methods is if the Karastan rug is tufted and the latex is failing, the integrity of the rug is compromised, or a few other reasons. Our Rug Cleaning Craftsmen clean all Karastan rugs at our facility. Complementary pickup and delivery is provided in our service area. Preinspection – every Karastan rug is thoroughly inspected prior to cleaning to ensure structural integrity, pre-existing conditions, weak repairs, cleanability, and other findings. Dusting dry soil removal – after the inspection each rug is thoroughly dusted using vacuum and agitation. Rug detergent – next a detergent that is safe for use on Karastan rugs is applied to all sides of the rug. Agitation – after the detergent is applied gentle mechanical agitation by the use of a planetary scrubber mounted with rug-safe brushes is worked across the rug. The rug is then flipped and the opposite side is gently agitated. Rinsing – copious amounts of fresh soft water is applied and worked through each rug to ensure the soil load is thoroughly removed. Spot treatments – if any of the spots or stains remain, at this stage we use safe-for-wool specialty spot treatments to attempt further spot/stain removal. Spot treatments are then rinsed again. Fringe cleaning – we treat fringe cleaning as a separate function from the rug cleaning, meaning we clean the fringe on its own after all other steps are completed. Drying – the rug is then hoisted onto a drying rack where air movement is applied to speed-dry the rug. We repeat 2 through 8 as necessary.